We offer a no-nonsense floor sander hire service! We offer professional dust free floor sanders at an affordable cost with professional advice. All of our floor sanders are more then capable of sanding wood floors from parquet, solid, engineered wood, floor boards, decking, work tops, stairs and the list goes on. We cover London, Surrey, Brighton, Sussex, and Essex including all surrounding areas. You can rest assured that no matter your capabilities, a beginner, keen DIY-er, or a professional trades person, we have a "dust free" floor sanding package for you. What Makes us different? We are honest!..... Take the fact or myth rather of "dust free" floor sanding machines.....there is no such thing! The correct term is "tested for wood dust". All machines will allow some dust to escape during the sanding process, our machines being some of the best around allow very little dust to escape, meaning you can work more safely and claenly. Or take The fact that we care and we take pride in what we do! Our machines are filly maintained and well look after. We correctly adjust the machines and clean them throughly, and give them a PAT test before every hire. That way we can make sure the floor sanding equipment you are hiring, is safe, clean and efficent. 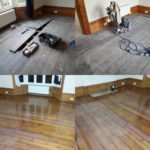 As you can see from page, we have previously worked on many different floor sanding projects, from the domestic home owner who just needs their wood floors sanding and refinishing, to the property developer with a large building to fully revamp. Whatever stage you’re at, you’ll be able to find inspiration and reassurance by seeing the results of projects we’ve worked on in the past. You’ll also find testimonials from our customers on our website and social media profiles. 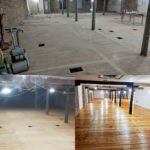 Absolute Floor Sander Hire is a owner-run company, and we don’t have someone sitting in "the office" who doesn’t have an idea about floor sanding! All our team are trained and qualified floor sanders with several years of experience each. It’s also worth noting that we only use dust-free floor sanding and equipment, including top brands such as Bona, Osmo, Junker’s, Morrells, Farrow & Ball and more. This is to help ensure you’re getting a convenient and practical service every time, and it’s all part of our professional guarantee. We don’t use "show pictures” or stock images from other companies. We are happy with all our wood floor sanding and refinishing projects and pleased to have so many satisfied clients who are happy to share pictures of the results we’ve achieved. If you look through our gallery or our blog, we’re sure you will see a room or area just like the one in your domestic or commercial property. Hopefully this will help you visualise the end result and get a good understanding of what you can expect from our experts. Add beauty and value to your home or business with Absolute Floor Sander hire and rental, remove imperfection, old finishes, and even out un-level and worn wooden floors. Perhaps you don't only want to revamp your floors; we also specialize in a number of different floor sanders for floor finishes, decking, skirting boards, worktops and more. Get your "dust free" professional floor sander from our highly skilled team, who have many years’ experience with wood floor repairs, heritage floor restorations and installations. 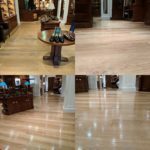 Our forward-thinking team produce professional workmanship using the latest techniques to achieve a superior finish to your home and commercial wood floors. Our clients are always 100% satisfied with the results of our skilled and professional workmanship. When choosing the specialists with experience in wood floor sanding and refinishing of old and new floors, you’re investing in your property. The quality of our work speaks for itself, and you will be more than pleased with our services. Read more about our professional services, or browse our gallery and view our examples of home and commercial projects. For superior wood floor "dust free" floor sanders, Absolute Floor Sanding is the preferred choice. Wood floors can last a long time when properly cared for and are the perfect investment for your home. Any existing deep cracks and flaking polish will reduce the value of your property and be an aesthetic nightmare. Why not add beauty and value to your home, and feel proud YOU did it! Wood floor restoration includes the removal of stains, old polish and years of grimy build up, and the repair and restoration of the surface with a new sealant, leaving you with an entirely new wood floor. Our dust free floor sanders are capable of sanding parquet, oak strip, pine floor boards, decking, kitchen work tops, skirtings, solid and engineered wood floors, leaving your home or office looking exceptionally stylish with a perfectly smooth floor surface, ready for treatment and refinishing. We have a prompt turnaround on all jobs, combined with unrivalled sanding and coating performance, which is all part of our standard floor sanding service. Customer satisfaction is critical to the Absolute Floor Sander Hire operation, which is why our company employs highly skilled floor sanders with a broad range of experience in wood floor refinishing to ensure industry, and clients’ high expectations are met. Clearly this holds optimum value for both our clients and our business. Whatever the project, we will always ensure: - Quality, and correctly adjusted, award winning floor sanding machines - Our expert advice on you floor sanding project - Prompt and reliable service - A complete demonstration of the machines creating a safe environment for the duration of the process - We have everything possibly needed to complete you floor sanding restoration project Whether residential or commercial customers, we know there can be a big difference between a finished floor and a floor with a truly superior finish. Simply contact us and we will be happy to deliver and demonstrate our "dust free" floor sanders at your home, business or any other place you need our services.